Learn more about the Intercultural Studies major at JBU. 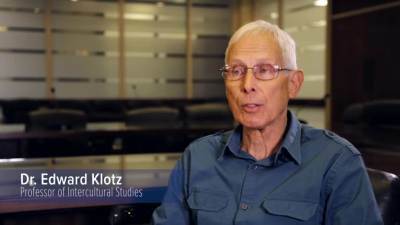 Dr. Edward Klotz: Intercultural Studies teaches the students how to model and communicate God's kingdom values to people of other cultures. Emily Henry: I wanted to be an Intercultural Studies major because I wanted to change the world of different people. Dr. Edward Klotz: Someone who loves people and loves to go visit other cultures and live and work within those cultures. Emily Henry: Besides all the facts that I've learned it's teaching me to love and serve people well and effectively and meet their needs and do that in a cross-cultural context. Dr. David Vila: The most important thing I'd like my students to learn is that God loves them, that He has a place for them in His world, and just for them to discover what that is and what their gifts are. Emily Henry: Being an Intercultural Studies major, also part of our degree is we're required to have an inter-cultural internship. Dr. David Vila: We take students on the Jordan Summer Studies program. On that program students earn nine hours of academic credit of core classes at JBU. The best thing about that kind of thing is that they take these Bible classes in the land where it happened. And so they get to, you know, dig up a pot that was around when King David was alive and it really brings the Bible to life for them. Dr. Edward Klotz: The key thing about this is that it's not that everybody's trying to get everybody to go overseas. It's where do you fit in to God's program. Emily Henry: If I can change the world for one child in a really bad situation maybe here or you know across the globe then that's what I'm here for and that's why I chose to be an Intercultural Studies major.